For the fourth year in a row ÅF held the conference ÅF Green Day. Now you can see a short film that summers up the event and you can also read a report of the discussed topics. Green Day aims to open up the dialogue and transparency around sustainability in order to increase the overall competence about sustainability and sustainable business. The theme of this year's conference was "Collaboration and partnerships driving sustainable development". 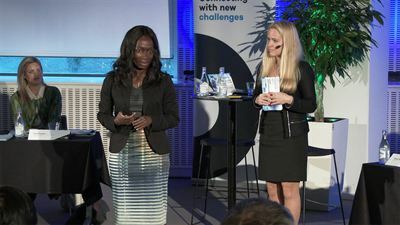 How can collaboration and partnerships between different sectors of the economy, between private and public, and between people influence the development towards a more sustainable society? To celebrate the 15th anniversary of the United Nations Global Compact (UNGC), and note that it was 15 years since the MDG’s were created, and discuss the importance of the new sustainable development goals (SDG’s) ÅF invited leaders from business, politics and representatives of civil society for a conversation on how the private sector will prioritize and work to promote sustainable development and drive social progress. During the day four panels discussed questions such as "15 years since the Millennium Development Goals - what happens now?" "How will future sustainable transport develop?" "What is the role of the Internet and the telecommunications industry to meet the global challenges?" And "What drives profitable, sustainable business?" The conference was attended, among others, Heidi Huusko, Programme Manager, Environment and Climate, UN Global Compact, Charlotte Petri Gornitzka, Director General, SIDA, Henrik Sundström, VP Group Sustainability Affairs, Electrolux, Caroline Jensen, General Transport Administration, Anneli Hulthén, Mayor of Gothenburg city Susanna Salwén, Corporate Citizenship & Corporate Affairs, IBM and Mia Horn af Rantzien, President & CEO of SNS - Centre for Business and Policy Studies. Here you can see a short movie of the day (in Swedish) and you can also download a summary report (in Swedish) of what emerged during the day.